I first want to disclaim and say that all opinions within this post are entirely Sarah's and not my own. This is a guest post, so please respect the poster and what she has to say. This post is my first guest post, and a post which is not made by me or collaborated by me either. Sarah asked a few other bloggers and myself if we would allow her to post her thoughts on a blog because her own blog is dedicated to solely K-pop and not J-pop. Because I love Sarah's writing, an also curious to know her thoughts on Juice=Juice, I accepted this... that, and I get to promote her! Amazing sauce, right? Please visit Sarah on her blog at Sarah in Kpopland! Chimians! Do I have some juicy news for you! No really, news doesn’t get much juicier than this. After inconspicuously wondering on his facebook whether he should reveal the name of the new unit which was obviously an announcement about his announcement, Tsunku has finally graced us with the name of the latest addition to Hello! 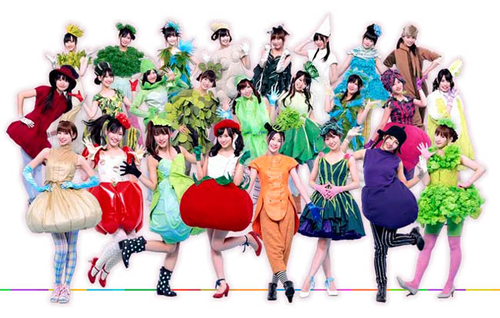 Project’s list of groups: Juice=Juice. Isn’t it just gorgeous? Now just like me most of you have probably all had opinions racing through your minds since the moments you’ve heard it. In my case some are more sensible than others, but in the end I find them all quite enjoyable. That’s why I’ve decided to share them with you, and what better way to do this than to ask Chiima if I can make a guest post on her lovely blog? So, what was my first reaction to seeing the name of our new unit? Well, since I read the name as any other person who has learned the basic signs I couldn’t help but think: “Well, that’s quite obvious isn’t it?”. If Tsunku had aimed to learn us something new then I have to say that the results will probably be quite disappointing since I’m quite sure that most people are aware that juice is juice. Still, I wasn’t very surprised since it isn’t the first time they use mathematical signs, ‘degree-C-dash-ute’ and ‘S-slash-mileage’ anyone? My only other problem with the name was that it didn’t really roll of the tongue, but Tsunku was ahead of me with that too. 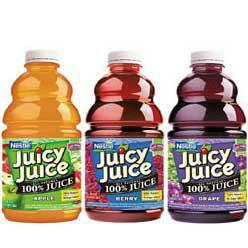 He told us that it is to be pronounced as ‘Juicy Juice’. Because even though we already knew that juice is juice, we didn’t know that juice is also juicy. I do hope that one day they’ll be popular enough to pop up when google searching them because otherwise it’ll be hard for us to find pictures of them. So, do I have any other thoughts on the name? Well of course! I couldn’t help but wonder what the new name would be of ‘MoBeKiMaSu’ now that Mano has left and JuJu has joined us. My personal hope was that it would be ‘Mo be kissing you’ because I found it funny, but alas, Tsunku once again provided us with an answer. It will be ‘MoBeKiSu J’. Now I don’t find it fair that they didn’t just add Juju to the name, why does it have to stand there all by itself? The J doesn’t even have a letter to accompany him! Let’s hope that Tsunku might show some pity after JuJu has left behind its indies stage. This brings us to the next question. What can we expect from them as indies? They’ll probably have to do some kind of promotional campaign just like S/mileage had to do with their ’10.000 smile campaign’, but what will it be? Will they have to hand people drinks with their logo on it so that they can spread their own juices or will they have to make juice with random strangers on the street? I’m curious and can’t wait to see what they will come up with. It might be fun since each girl has been assigned her own fruit so they might actually get to spread their own juice. It’s good that Hello! Project is learning from AKB48 but I think they might want to consider being more selective in what idea’s they decided to adopt. Still though, this did help me along when it came to my expectations of their first indies single, or, their outfits, to be more specific. You think H!P wouldn’t do that to their precious girls? Well, say that to our dear Berryz Koubou who have been strutting around as pineapples, fishes and more. The only plausible reason I can find for them not to put the girls though this torture is because they aren’t in fact fruit, they are fruit juices. Therefore it wouldn’t be logical to dress them up as fruit, it would make much more sense to send them on stage with bottle dresses! All I can say is that I fervently hope that Kanazawa Tomoko (apple) won’t have too much of a bubbly personality or else she will have to take care whenever she is near Riho. Either way, I expect this group to have many yummy songs. Even though I personally don’t know much about the girls yet, I am curious to find out more about them. For now all I know is that Karin has many fans and that I am glad that she will no longer be mentioned with every new morning musume generation. I was slowly starting to start to suffer the ‘I only dislike the girl due to her fans’ syndrome and I am glad that chances are that this will now be avoided. 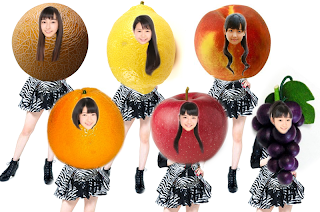 This is why I’ll just assume that Melon (Uemura Akari), Lemon (Takagi Sayuki), Peach (Miyazaki Yuka), Orange (Otsuka Aina), Apple (Kanazawa Tomoko) and Grape (Miyamoto Karin) will make a nice fruit bouquet together and I will try each out in order for me to find out which will be my favorite fruit. Okay, that's it I guess. 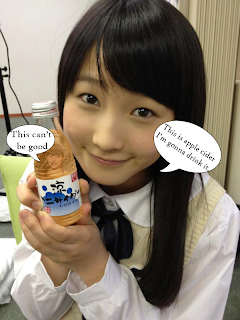 I have no idea whether or not I will post my own thoughts later on concerning Juice=Juice... who knows?